Select the dimensions that most closely match your furnace filter or air conditioner filter. How do I measure my furnace filter? Click here for custom-sized filters. If you have an air cleaner that requires a special media type furnace filter, click on a logo below to see the complete selection from that manufacturer. How do I find my furnace filter dimensions? Can I wash or vacuum my furnace filter? How long will my furnace filter last? What is the difference between OEM and Generic? What is a media filter, and how do I know if I need one? Can I get a HEPA furnace filter? MERV stands for Minimum Efficiency Reporting Value. MERV is a numerical value given to furnace filters in order to identify its filtering abilities. This is now an international industry standard set up by the committee that oversees the furnace filter industry. This standard is used for determining a furnace filter's ability to capture and hold dirt and dust in specific size ranges. Some furnace filter manufacturers such as 3M use their own rating system, which is not approved as an industry standard. A human hair is 20-40 microns in size. MERV ratings are determined by adding particles of varying sizes (1-12) into a controlled testing environment. The particles are added upstream of the test filter and a laser particle counter samples the air before it enters the furnace filter and after it leaves the furnace filter. The two particle counts are compared to calculate the Particle Size Efficiency of the tested furnace filter. Once this is determined, a MERV Parameters chart is used to determine the MERV rating. MERV ratings range from 1 - 16 and measurements are in microns. Some of the common particles related to MERV ratings are pet dander, insecticide dust, smog, dust, viruses, wood, tobacco smoke, spores, bacteria and pollen. Some of the most common furnace filters found in residential use only have a MERV rating of 1 to 4. Often times these furnace filters are not assigned a MERV rating. These are typically disposable panel type filters and do not do a good job of filtering the air because they will not stop particles smaller than 10 microns. MERV 5 to 8 rated furnace filters are a better choice and are more commonly found in commercial applications. These furnace filters will collect particles as small as 3 microns and are a good choice for homeowners. Furnace filters with a MERV rating of 9 to 12 are used in commercial and industrial applications and will stop particles in the 1 to 3 micron range. These furnace filters are a great choice for homeowners who want the best dust control possible. When using furnace filters in this group it is important to change them on a regular schedule because if they become heavily loaded with dust they can have a negative impact on equipment performance. What do filter rating scores indicate? The furnace filter performance rating system can be used to compare one furnace filter to another and describes a filter's ability to remove particles from the air. The HVAC, (Heating, Ventilating and Air Conditioning) industry uses ASHRAE 52.2 testing, which assigns a Minimum Efficiency Reporting Value (MERV). A larger MERV number means better filtration. The Filtrete� Advanced Allergen, Filtrete� Ultra Allergen, Filtrete� Micro Allergen, and Filtrete� Dust & Pollen are rated as MERV 12, MERV 11, MERV 11 and, MERV 8, respectively. 3M highlights the portion of the ASHRAE 52.2 test that focuses on sub-micron particles with its own performance rating. The furnace filters above receive 1500, 1250, 1000 and 600 ratings, respectively. Most furnace filters have two sets of dimensions: Nominal and Actual. If your furnace filter has actual measured dimensions of 15�" x 24�" x �", you would search based on the nominal dimensions of 16" x 25" x 1". When determining the size of furnace filter you need, it is best to measure each dimension of your existing furnace filter, and then find the closest nominal match. To find the nominal dimensions of your furnace filter, you should round the actual dimensions of your furnace filter up to the nearest 1" on each side. 16" x 25" x 1" is the same as 25" x 16" x 1"
You want your furnace filter to fit snugly, without having to force it into place (this can cause the furnace filter to tear or buckle, which could destroy the filter, or reduce its effectiveness). If, after installation, you find that there is air leaking around your furnace filter, you can add furnace filter gasket tape around the edges of your furnace filter to fill in the gaps. Many people try to wash or vacuum their furnace filters to extend the life. Washing your furnace filter is generally a bad idea. Many filtering materials do not hold up well when wet, and washing your furnace filter significantly increases the risk for mold or microbiological growth on the filter itself (which will release those mold spores into the air that is circulating throughout your home). Vacuuming your furnace filter is a healthier alternative to washing your furnace filter, but is still not recommended. Although you may slightly prolong the life of your furnace filter, you will probably make a mess doing it, and a vacuumed filter will release a lot of dust and particulate into the ductwork when you first re-install it. Additionally, most furnace filters are made from a delicate filtering material and are prone to ripping or tearing, which will render the filter useless. The exception are permanent washable furnace filters, which can be washed periodically to restore them to their full filtering capacity. The length of time that a furnace filter can last depends on many environmental factors, such as fan hours, pets, carpet, kids, etc. Generally, most 1� furnace filters should be changed at least every 2-3 months. Larger, pleated cartridge-type furnace filters (3" to 5") can last up to 12 months between changes. What is the difference between OEM and non-OEM? "OEM" stands for Original Equipment Manufacturer. OEM products are officially sanctioned or directly manufactured by the same company who made the your air cleaner, air handler, furnace, humidifier, etc. Generic aftermarket products are made to the same specifications as OEM product � but are manufactured by a 3rd party. Generic products are typically less expensive than OEM products, and usually exhibit the same quality of construction. 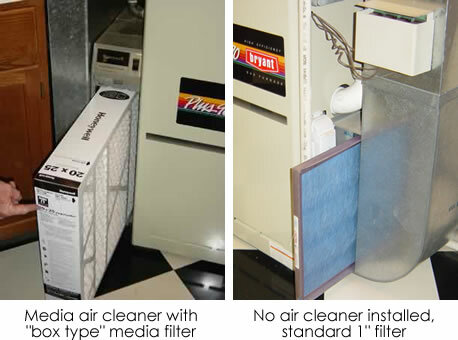 In the above illustration you can see the difference between a media type furnace filter and a standard 1" furnace filter. The media filter is made to fit in a specific air cleaner, and is usually "box style" filter that may be between 3" and 5" in thickness. The standard 1" furnace filter is not typically installed in a special air cleaner, but usually just in the path of air flow. A 1" furnace filter may have pleats, or it may be of the traditional fiberglass design (very common for new construction homes). A HEPA filter uses a dense filtration material and must remove at least 99.7% of airborne particles that are 0.3 microns or larger. This level of filtration is much better than a standard pleated or fiberglass filter. 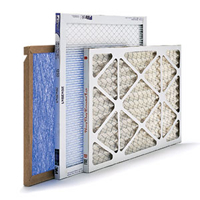 Unfortunately, HEPA filters restrict too much air to be used as a traditional furnace filter. A HEPA filter is extremely efficient, but a significant amount of air pressure is needed to force air through a HEPA filter. A typical HVAC system will not be equipped to provide enough air pressure to use a HEPA filter (which basically means that no air would blow out of your registers). In order to use a HEPA filter for whole house filtration, you need to install a separate HEPA filtration system. A system like this will pull some of the air out of the regular air flow through your furnace, and then boost the air and pass it through a HEPA filter. The extremely filtered air is then returned back into the normal air flow. Click here to browse whole house HEPA filtration systems.